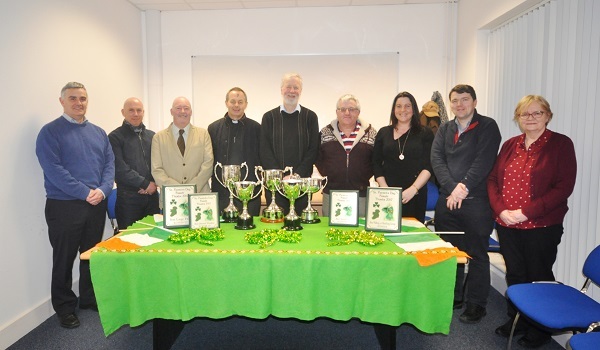 The official Launch of the 2017 Thurles St. Patrick’s Day Parade took place on 1st March in the Thurles Chamber Enterprise Centre. An array of trophies, plaques and medals were on display at the launch, courtesy of Michael’s Jewellers, one of our main sponsors. We were also delighted to have Father Martin Hayes present on behalf of Archbishop Kieran O’Reilly adding greatly to the opening of the Thurles celebrations to St. Patrick. The Thurles St. Patrick’s Day Parade will take place on Friday the 17th March 2017 at 4pm from Abbey Road, Thurles. Preparations are well under way for this year’s parade. This years theme is a sporting one “Sporting Heroes throughout the Ages” If your club or group have a sporting achievement or person they wish to record, it is an ideal opportunity to highlight the success of the club or an individual. However, any group wishing to participate is not required to adhere to this theme, if they have another of interest or wish to promote any aspect of their own group or club they are welcome to do so. The Thurles parade committee are putting out a request for help, they seeking volunteers to help out as stewards and assist with other duties on the day. As the parade has grown over the years so has the need for additional members to aid in the delivery of the Thurles Parade to ensure safety and proper monitoring of procedures. There will be small farm animal display in lower Liberty Square Moloney’s Mobile Farm, face-painting artists on hand to colour the young in shades of green or designs of choice, Jim O’The Mills Band will fill the air with traditional music all prior to the parade. In the parade proper there will be marching bands, school bands, dancing troupes, vintage cars and a few surprises. In addition, at Westgate Lower Friar St. the Thurles Silver Band will be in situ playing some all time favourites throughout the parade at intervals, with their new members making their public debut. We look forward to seeing and hearing them lift the roofs with their brass and percussion instruments. It is strongly rumoured that Donald Trump will make an appearance at the parade and there is a suggestion he may want to build a wall on the borders of Tipperary. We are delighted to announce our very special guests on the reviewing stand will be “Ireland’s Fittest Family” The Cummins Family from Rahealty. Thurles St. Patrick’s Day Parade Committee are inviting all shop owners and business premises in Thurles to display a St. Patrick’s day theme in their windows on the lead in to St. Patrick’s Day. We are looking for imagination, colour, creativity and an aesthetic greening of shop fronts and premises to announce the arrival of our national day of celebration on the 17th March. Prizes will given for the best dressed window and the most traditional window, over the last few years the standard has been very high making it difficult for the judges to pick winners. The display period will be from the 10th March to the 17th March and the judging will take place over the final days of that period. We hope the standard will be as high again this year and we look forward to seeing the quality of displays throughout the town. Parade entries and sponsorhips are still being accepted, any business or organisations interested in supporting or participating in the parade and have not yet received an entry/sponsorship form please contact the chairperson Johnny Kenehan at 087-9964587. Hugh Ryan’s Pharmacy, O’Meara’s Solicitors, Vale Oil Co., Dew Vally Meats, The A.I.B., LIDL, The Irish Country Womans’ Association, The Thurles Credit Union, Pat Cleary Motors, Jennings Opticians, Sammons Pharmacy, Hanafin’s Furniture Store, The Tipperary Star, The Premier Hall, Martin Shanahan Tyres, Centenary Co-Op, Darwin Tree Specialists,Michael’s Jewellers, Thurles Lions Club, Thomas Murphy & Sons Machinery, The Anner Cleaners, Liber Tea Rooms, Executive Menswear, Stakelums Fashions, Marie Therese Fashions, Unique Hair Design, The Thurles Chamber of Commerce, Thurles Enterprise Centre and McMahons Shoe Shop, Bowes Travel, Michael Lowry T.D., The Mona Lisa, The United Nations Veteran Association and Grace’s Fashions. A bucket collection will take place on the day of the parade to afford the public an opportunity to support the Thurles Parade and help defray the rising cost of running such an annual event.